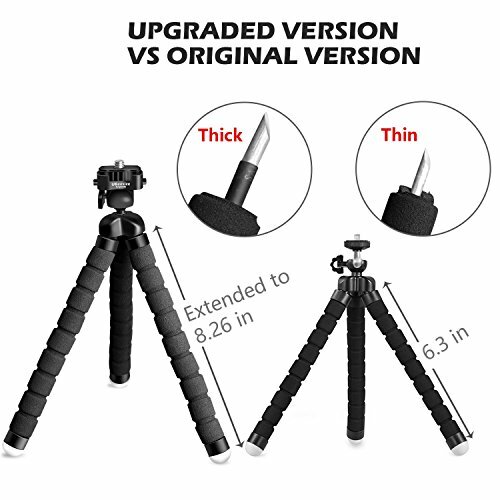 【All upgraded】- this new small bendy tripod is a full Update to our best-selling phone tripod in us market. 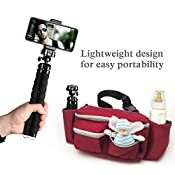 It is upgraded in both material and structure for top-grade performance. 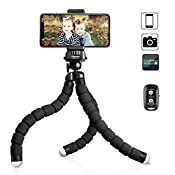 By 10.6 inch, UBeesize tripod S is one of the tallest cell phone tripods on the market, gives a greater possibility of wider applications. 【Durability for years】&【3-year replacement warranty】- flexible Octopus style legs are made of thicker Premium metal & full metal connector, reinforced with coating rubber and compact foam. It is rigged to the greatest Degree to handle the wear and tear of everyday explorations or the rigor of adventure. 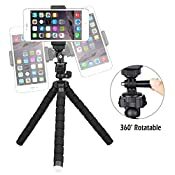 【Increased stability】- A high grade metal ball joint supports phone/camera up to 1kg, it locks the heaviest smartphone into position securely. 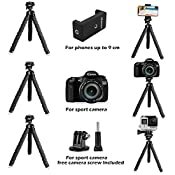 And non-slip feet design keeps this adjustable tripod steady on virtual ground surface. 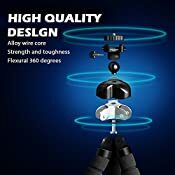 【Selfie mode made possible】- A wireless remote control allows you take shots (portrait and landscape) from a distance of up to 30 feet, Perfect for taking selfies, group photos, filming, vlogging and steady tripod shots. 【Universal phone mount adapter】- works for smartphones up to 3.54" wide like iPhone 8/8 Plus/x/7 Plus/7/6S Plus/6S/6 Plus/6 & Samsung. 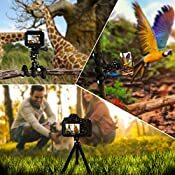 By a standard ¼ inch adaptor screw thread, It is compatible with digital cameras like Nikon/Canon, DSLR, GoPro (GoPro adapters included).